The Washington DC area has plenty of great water parks that offer a full day of family fun and the perfect way to cool off during those hot and humid days of summer. What's better than lounging in a lazy river, splashing around in a wading pool or enjoying the thrills of a mega water slide? Here is a guide to the water parks in Maryland and Northern Virginia. 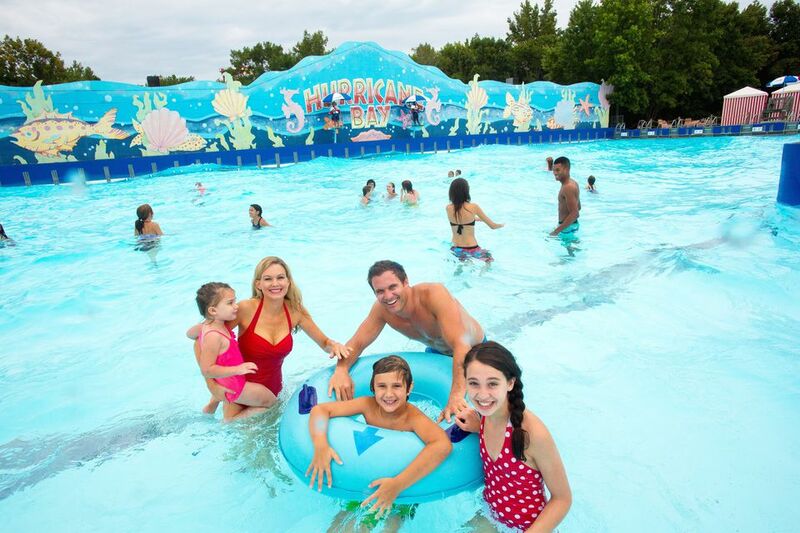 Most are open Memorial Day through Labor Day, so mark your calendar and plan some splashing fun with the whole family. Six Flags America' Hurricane Harbor - 13710 Central Ave. Upper Marlboro, MD. (301) 249-1500. Six Flags America has a five-story interactive water tree house, one of the largest wave pools in the country, water slides, inner tube flume, lazy river, splash pool for the younger crowd and more. Admission to the water park is included in the Six Flags ticket price so you can enjoy a full day of fun with more than 100 rides, shows and the largest water park in the Washington, DC area. Allentown Fitness & Splash Park - 7210 Allentown Road, Fort Washington, MD. (301) 449-5567. Allentown Fitness & Splash Park has a 50-meter splash pool with slides, lily pads, log walks, a diving well with a 1-meter board, a wading pool, a picnic area with a volleyball court, and a snack bar. The indoor fitness center includes a heated, 25-yard, 6-lane pool with a chair lift, a heated training pool (2 ½ - 3 feet deep), a hot tub, two racquetball courts, a Nautilus weight room, a cardiovascular room, and lockers. Gaithersburg's Water Park at Bohrer Park - 510 South Frederick Avenue, Gaithersburg, MD. (301) 258-6445. The Water Park at Bohrer Park includes several activity areas with lap swimming, raindrop umbrella, and a double water slide. The splash pool, designed for children under age five, has a frog slide, seal spray, and a special eating area. Lane Manor Splash Park - 7601 West Park Drive, Hyattsville, MD. (301) 422-7284. Lane Manor Splash Park is a 40-acre park with a 25-meter pool, including two slides, lily pads, a snake, and an alligator, and a separate wading pool. The pool is operated by the Prince George's County Department of Parks and Recreation and offers daily and monthly admission passes. Paramount's Kings Dominion Soak City - 16000 Theme Park Way, Doswell, VA. (804) 876-5000. Soak City is a 20-acre water park with a 650,000-gallon wave pool, water slides, and more than 50 water attractions. Admission to the water park is included in the Kings Dominion ticket price so you can enjoy a full day of fun with more than 60 rides, 15 roller coasters, and live family entertainment. Atlantis Water Park at Bull Run Regional Park - 7700 Bull Run Drive, Centreville, VA. (703) 631-0552. The water park includes a 1,000-gallon dumping bucket, water slides, waterfalls, squirters and dedicated areas for younger kids. There are shaded areas, a sundeck, and a snack bar. Great Waves at Cameron Run - 4001 Eisenhower Avenue, Alexandria, VA. (703) 960-0767. Great Waves at Cameron Run includes a wave pool, three-flume waterslide, water playground, lap lanes, bathhouse, snack bar, and raft rental. Also, nearby are a miniature golf course, batting cages, picnic shelters, and a lake. Volcano Island at Algonkian Regional Park - 47701 Fairway Drive, Sterling, VA. (703) 430-7683. The water park includes twin 140-foot water slides in the main pool. A zero-depth entry, 18-inch-deep play pool surrounds an interactive play feature with a huge bucket that pours out 1000 gallons every 3 minutes. Signal Bay Water Park - 9300 Signal View Dive, Manassas Park, VA. (703) 335-8872. Signal Bay Water Park features an activity pool with water cannons, slides, and a lazy river. The facility is run by the City of Manassas Park Parks and Recreation. Daily and seasonal rates are available. Splash Down Water Park - 7500 Ben Lomond Park Drive, Manassas, VA. (703) 361-4451. Splash Down Water Park, Northern Virginia's largest water park, has five water areas, covering 11 acres, including zero-depth beach area, lazy river, boat slide, water raindrops and bubblers, funbrellas and pavilions for shade, children's area with kiddie slides, lap pool, and water slides. Water Country USA - 176 Water Country Pkwy, Williamsburg, VA. (800) 772-8886. Water Country USA features water rides and attractions, entertainment, shopping, and restaurants -- all set to a surf theme. Kid's Kingdom has water slides for young children, including play equipment, slides, fountains, a skill games area; Polliwog Pond, a dry play area, and an outdoor theater. The Water Mine Family Swimmin' Hole - 1400 Lake Fairfax Drive, Reston, VA. (703) 471-5414. At the Water Mine relax on an inner tube on Rattlesnake River or let your toddlers play in Tenderfoot Pond, a gated, "zero depth" pool with a pint-sized slide, water-spewing turtle, and gentle bubblers. Admission includes unlimited rides on the carousel and tour boat. Pirate's Cove Waterpark at Pohick Bay - 6501 Pohick Bay Drive, Lorton, VA. (703) 339-6104. The pirate-theme water park features a 24-foot high play structure with a 300-gallon dumping bucket, water slides, and squirters. Kids can dig in the sand and search for buried treasure at Buccaneer Beach. Ocean Dunes Waterpark - Upton Hill Regional Park, 6060 Wilson Boulevard Arlington, VA. (703) 534-3437. The region's newest water park includes tube slides, open slides, fountains, squirters, platforms and a giant 500-gallon dumping bucket. Mini-golf and batting cages are also located in the regional park.